Networks/Fieldbus by Turck | Ohio Belting & Transmission Co.
Turck offers intelligent bus stations, with built in bus electronics, interface with your existing devices. TURCK bus stations provide diagnostics, short circuit protection, automatic baud rate detection, and are node addressable. CANopen is a higher-layer system based on the CAN (controller area network) specification that defines device and communication profiles. Device profiles standardize the data content of the various supported device types, while communication profiles determine the method of data exchange between the devices. The basic communication methods are real time data (process data objects – PDO) and parameter data (service data objects – SDO). DeviceNet is a low-cost communications protocol that eliminates hard wiring and connects industrial devices such as limit switches, photoelectric sensors, valve manifolds, motor starters, process sensors, bar code readers, variable frequency drives, panel displays and operator interfaces to a network. DeviceNet’s direct connection provides improved communication between devices, as well as important device-level diagnostics not easily accessible or available through hard-wired I/O interfaces. Ethernet is the most popular protocol used to connect office computers and peripherals today. It is increasingly findings its way into other applications, and is rapidly becoming the network of choice for higher level industrial control applications. 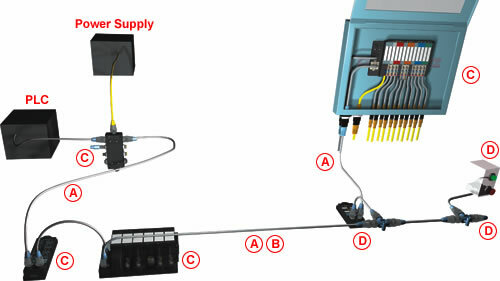 Ethernet is primarily used to connect PLC’s, computers, HMI displays and other high level components. 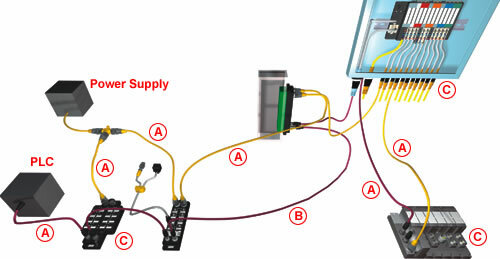 Foundation fieldbus is a communications protocol and physical method to interconnect smart devices such as temperature transmitters, pressure transmitters and valve actuators. The physical layer conforms to ISA SP50.02 and IEC 1158-2 standards for fieldbus. Fieldbus technology allows many smart devices to share one communication medium. The digital communication signal is superimposed onto a DC carrier. This reduces the amount of terminations to connect all the field devices to a host system and allows greater flexibility for future additions of I/O points. HART (Highway Addressable Remote Transducer) provides digital communication to microprocessor-based (smart) analog process control instruments. Originally intended to allow convenient calibration, range adjustment, damping adjustment, etc. of analog process transmitters; it was the first bi-directional digital communication scheme for process transmitters that didn't disturb the analog signal. 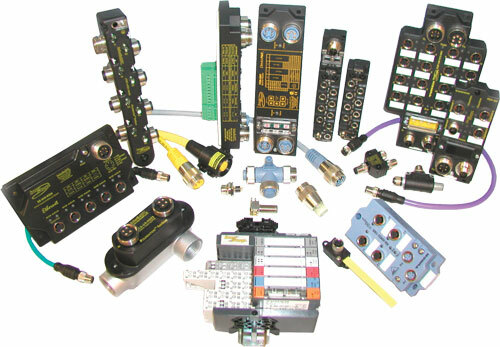 HART has since been extended to process receivers, and is sometimes also used in data acquisition and control. HART specifications continue to be updated to broaden the range of HART applications. Profibus-DP is an industrial network protocol that connects field I/O devices in order to eliminate hard wiring. The network connection increases device-level diagnostic capabilities, while also providing high-speed communication between devices. Profibus-PA (Process Automation) uses synchronous transfer mode technology, as defined in IEC 61158-2, to communicate between field devices and the RS 485 backbone of Profibus-DP. 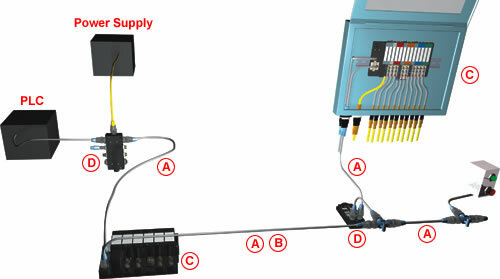 A segment coupler, or gateway is installed to bridge profibus-DP with Profibus-PA. Otherwise, the protocols are identical, allowing transparent communication between general purpose automation systems and decentralized field devices. The Smart Distributed System, developed by Honeywell's MICRO SWITCH Division, is a bus system for intelligent sensors and actuators. The SDS system is based on CAN as defined in the Bosch V2.0 CAN Specification. SDS allows multiple nodes to share a single bus. Over a single 4-wire cable, Smart Distributed System can interface up to 64 nodes with a maximum of 126 addresses. These intelligent sensor and actuator devices do more than just turn on and off. Smart Distributed System devices have advanced device-level functions, system and device diagnostics. SDS is based on a three layer communication model. The Application Layer specifies system services and protocol. The Data Link Layer provides functions and procedures to establish, maintain and release data-link-connections among devices on the network and to transfer data-link-service-data-units. The Physical Layer provides the mechanical, electrical, functional and procedural means to activate, maintain and de-activate physical connections for bit transmission between data-link-entities. Physical Layer devices are interconnected by physical media.